I started working at SAM in July 2013. On perhaps my second week on the job, I was invited to a meeting about the new brand and website, which were designed by Hornall Anderson. "We have a new brand!" they said. "Great!" I said, as the newly minted copywriter, the first writer SAM had in over a decade. "So, what's SAM's voice?" "Visit SAM to see a museum carved into the city. Our three dynamic locations celebrate the region's position as a crossroads, where east meets west, urban meets natural, local meets global. Our collections, special exhibitions, and programs feature art from around the world and build bridges between cultures and centuries. SAM is Seattle, here to serve its cultural life and as much a part of its personality as the coffee, rain, mountains, Pike Place Market, and the Space Needle. Our three locations stand together, as do the letters in our new logo: the museum is an entryway to the world, as is the logo's design that allows you to peer through to what's behind. And our new website, coming soon, is a lively visual experience, which will inspire you before you ever arrive. Explore SAM from the comfort of your home or while on the go—wander through our works of art, browse our upcoming events, and learn about the current special exhibitions. Our entire site is streamlined, redesigned, and rebuilt so that you can easily find what you're looking for. For example, the new calendar features a full week's lineup of activities, from art workshops to film series! Discover things you never knew were happening. Our deepest thanks to Microsoft for supporting this project from start to </finish>." So I gave SAM a new voice—one that was bold, cheerful, accessible, and welcoming. One that makes the museum a friendlier and less intimidating place (all that history! all those opinions! all those names and dates!). Being at the museum, I had quickly discovered out that everyone there was so helpful. The curators were so passionate, and so eager to explain everything that they knew. They were interested in what visitors had to say, and what children liked. The education department just really wanted people to come to events to start a conversation—to fill the museum with noise. It turns out that's what the communications/marketing department wanted too. So I tried to capture all of that in the new brand personality. I let SAM's voice get a little looser, a little faster, a little more like a real person was speaking. I also filled in the brand guidelines with examples of how to be bold, cheerful, accessible, friendly, and welcoming. And wrote a 50-page content style guide detailing all the intricacies of language used in a museum setting—terminology, spelling, naming—you name it, it's in there. I'm sure people are using it every day. I really hope they are. 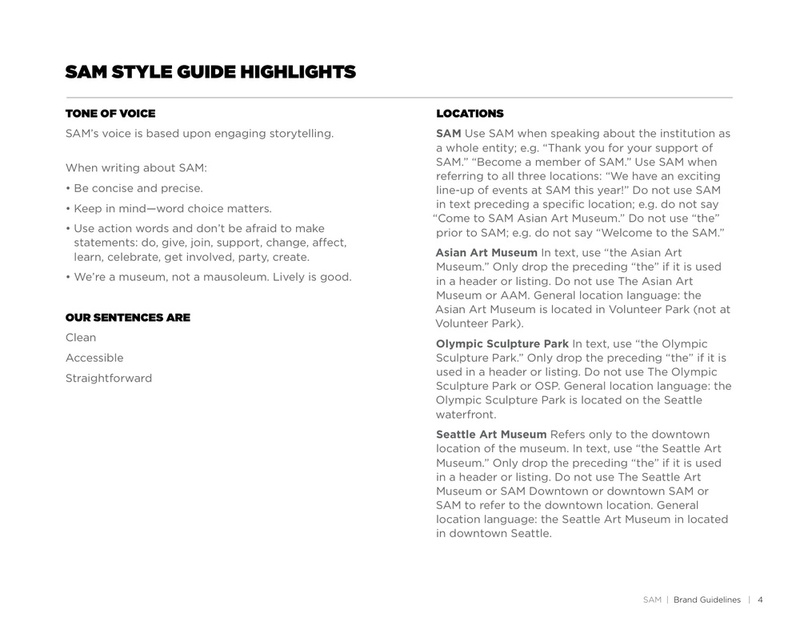 The Style Guide, thorough and thoughtful, means that SAM materials are consistent. Consistency is not to be underestimated. Neither is proofreading. Neither is the serial comma.